Photography: Laura Kenny, catwalkqueen.com, uhsecho.com, houseofholland.co.uk, chicotrading.com, hji.co.uk, bellasugar.com. *My favourite hair trend at the moment is the revival of the bandana. 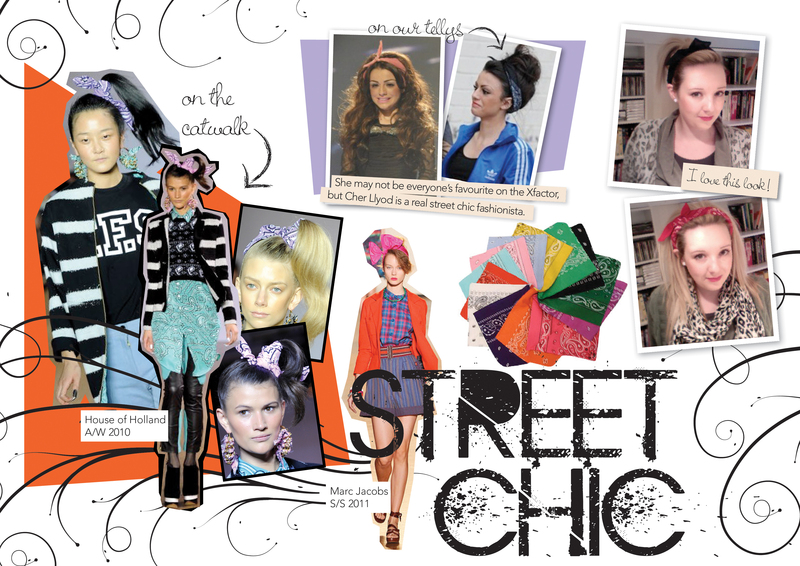 The classic printed hair accessory has been given a new lease of life and seems to be a growing trend among the streets of Dublin. The key look is all about hip-hop inspired take on street style. I first noticed it in the A/W 2010 collection House of Holland. The models strutted their stuff in bandana printed pieces hair styled in ponytails tied with bandanas. I then wanted one! I bought a black and red bandana from a vintage retailer at Goodwood revival festival. At £3 each, it was a recession-budget friendly buy and also a great fix for not-so-good hair days!!! This entry was posted in Trend Hunter and tagged bandanas, catwalk, hip-hop, house of holland, marc jacobs, urban, xfactor. Bookmark the permalink.